Summer is slipping through my fingers like a soft ice cream cone on a sweltering afternoon. Can it really be the middle of July? Where the heck did June go? In my bewilderment at this unnaturally speedy passage of summertime, I completely missed writing about my little summer reading challenge when I actually started it. So, while I’ve been purposefully reading specific books for a good month, I’m only now getting around to writing about it here. And what is this reading challenge, you ask? First, I believe a brief back story is on order. I occasionally read the blog The Bookshelf of Emily J. Among other things, Emily is working her way through The BBC Top 100 Must Read Books List*(her list is here). The BBC Top 100 is a Facebook meme** which has the audacity to claim most people have read no more than 6 of its 100 selections. Reading Emily’s list prompted me to revisit my results of the same compilation which I completed about two years ago. At that time, I’d read 33 of the 100 suggestions but I have since completed several more books. I also realized that many of the books I still hadn’t read were languishing around my home just waiting for some curious soul to crack them open. And that, dear readers, was when The BBC Top 100 Summer Reading Challenge was born. The goal: to read as many unread books on The BBC Top 100 as I can this summer and still live a somewhat productive life. No buying, borrowing, bartering or stealing allowed; books must to be located somewhere in my house. I’m posting my list below with the books I’ve read so far in bold type. 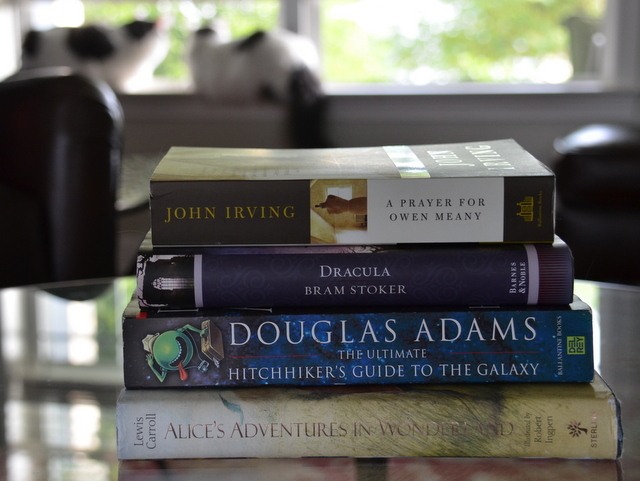 Books with an asterisk beside them are ones I’ve read since the the Summer Solstice (only three so far). Italicized books are selections I’ve started but not finished. When I began this challenge, I’d read 38 selections (40 books total). To date, the tally is up to 43.5. After reading Alice in Wonderland, Dracula, and The Ocean at the End of the Lane (not part of the challenge but I couldn’t help myself), I felt my reading was taking a definite turn down a very dark road. To lighten things up, I chose The Ultimate Hitch Hiker’s Guide to the Galaxy by Douglas Adams. And, I’m struggling with it a bit. When I’m in the mood for light and fluffy, the book is fine. However, sometimes I find myself craving more substance and then reading it feels like a chore. This is not a criticism of the book, by any means. It’s more an observation of my capriciousness. The BBC Top 100 List Summer Reading Challenge ends on September 21,2013. Looks like it’s going to be a classics kind of reading adventure and that’s just fine with me. Wish me luck! *The BBC Top 100 Must Read Books List was probably designed by a Facebook user and doesn’t have any official ties to the BBC. The list slightly resembles The BBC’s Big Read compilation from 2003 but that is probably is as far as the connection goes. Even though the origins of the list are sketchy, it contains many worthy books and that’s why I decided to use it for my little challenge. **meme: an Internet chain letter that is sent from person to person. Very absorbing narrative… good work indeed..! Thanks for the recommendation. I’ve just started a Prayer For Owen Meaney and then I’ll be diving into The Count of Monte Cristo. I can’t wait! Sorry for the late reply, James. Time really is flying by and I keep losing track of it. I’m enjoying working my way through some of the books on the BBC list this summer. It’s been a great experience. I totally understand Stephany as we all lead busy lives. Time does seem to fly past when we are engrossed in something we enjoy doing. What a great list! Thanks for getting my reading juices flowing…..
Jane Austen is one of my favorite authors. I think you could pick any one of her books and be happily satisfied. I’m like you – I’ve seen several of the books on the list as movies before I’ve read them. Because I’ve seen all the Harry Potter movies, I’ve had a very hard time getting into the books. I’m going to try again before the summer is officially over. Good luck with your reading! It is inspirational, isn’t it? I just finished reading A Prayer For Owen Meaney. What an incredibly original tale! It’s a long one, but I highly recommend it. So how have you done?! That’s quite a list!! ….. and there are some fabulous books in there. Hi, Noeline. I’m sorry I missed your comment earlier. I’m still plugging away at the list even though summer is long gone. I started reading the Harry Potter series and am enjoying it so much that’s all I’ve been reading since the middle of September. I’m on Book 4 (Goblet of Fire) now. I’d like to read The Count of Monte Cristo or some Charles Dickens once I’ve conquered Harry. Thanks for asking!